By the age of 18, the average adult has 32 teeth; 16 on the top and 16 on the bottom. Each one having a specific name and function. A typical mouth only grows large enough to hold 28 teeth without significant crowding. This is why it can be painful when 32 teeth try to fit into a space made for 28 teeth. 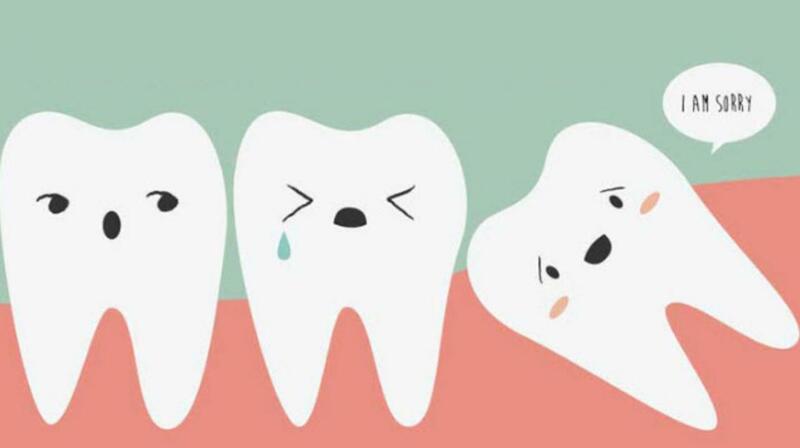 These four extra teeth are called your third molars, or “wisdom teeth”. Third molars are usually the third set of molars to erupt in the mouth. Hence the name, third molars. 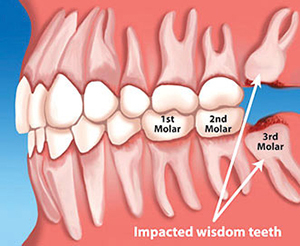 The other name for third molars is wisdom teeth. This is because of the fact that they erupt in early adulthood when you start to become wise. A time when you have (hopefully) accumulated some wisdom. Or at least feel like you have. 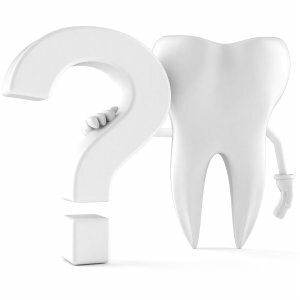 If you don’t know what to do when your wisdom teeth start growing in incorrectly, we can help! 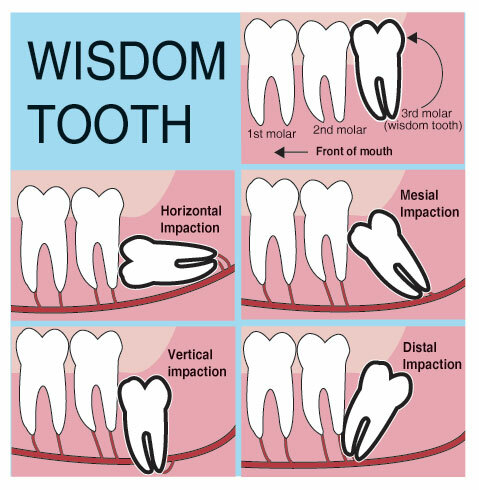 This page will help you understand what can go wrong with wisdom teeth. We will also tell you what you can do to fix them. Unfortunately, possessing wisdom teeth that grow in perfectly is the exception, not the norm. Partial eruption through the gums – Wisdom teeth may only partially break the surface of the gums, usually due to growing in sideways. When this happens, bacteria can seep in and cause disease and infection. Remaining hidden beneath the gums – Occasionally, wisdom teeth will be unable to break the surface of the gums at all, causing them to become trapped (impacted) within your jaw. Crowding out other teeth – If your mouth does not have enough room for wisdom teeth to come in naturally, then their arrival may cause crowded or damaged teeth due to a lack of space. The extraction of wisdom teeth is necessary when they are prevented from properly erupting within the mouth or are misaligned due to some type of facial trauma. It is important to remember that impacted teeth can take many positions in the bone as they attempt to find a pathway that will allow them to successfully erupt. The pressure from the improperly erupting wisdom teeth may or may not disrupt the orthodontic or natural alignment of teeth, but do increase your chances of experiencing oral infection. When wisdom teeth are partially erupted, the opening around the teeth allows bacteria to settle in. And if proper cleaning does not take place, a condition called pericoronitis (inflammation of the crown) may occur. The result: swelling, stiffness, pain, and illness. In some cases, the pressure from the erupting third molar can cause pressure resorption (erosive deterioration) of the second molar root. When this happens, the third molar touches and predisposes the second molar to premature tooth decay. It has been shown in studies in adults that the retention of the impacted third molar is most often related to bone loss or poor periodontal bone support over time. Another serious problem (but one that has a low occurrence) is tumors. Particularly when tumors or cysts form around the impacted wisdom teeth, resulting in the destruction of the jawbone and adjacent healthy teeth. Removal of the offending impacted teeth usually resolves these problems. But in the case of tumors, early removal is recommended to avoid some of the more harsh consequences. 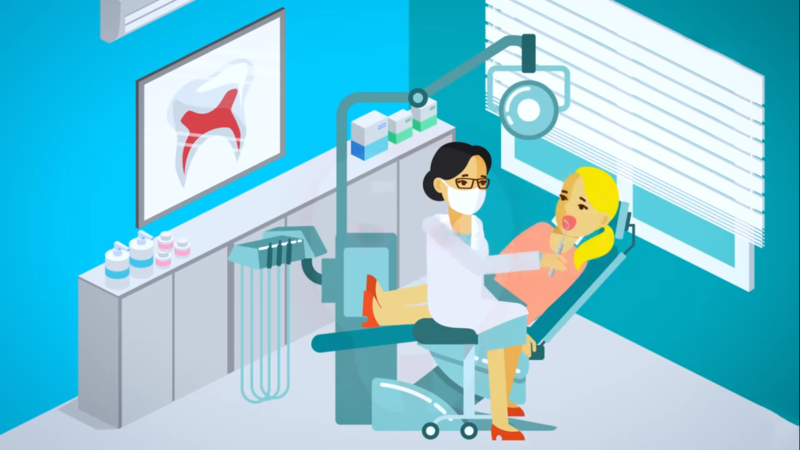 With an oral examination and x-rays of the mouth, Dr. Chun can evaluate the position of the wisdom teeth and predict if there are any present problems or any future ones that may become issues down the road. Studies have shown that early evaluation and treatment result in a superior outcome for the patient. When it comes to wisdom teeth, patients are generally first evaluated in the mid-teenage years by their dentist, orthodontist, or a maxillofacial surgeon, and are then re-evaluated later in life. Catching wisdom tooth problems while they are still small can make solving them easier for both the patient and the doctor. Meaning, removing wisdom teeth that are showing signs of growing in incorrectly, before they cause additional problems (such as infection or disease) can save you time, hassle, and toothache down the road. All outpatient surgery is carried out under appropriate anesthesia according to state-mandated standards to maximize patient comfort and safety. If you’d like to learn more about the process, check out our before anesthesia page. 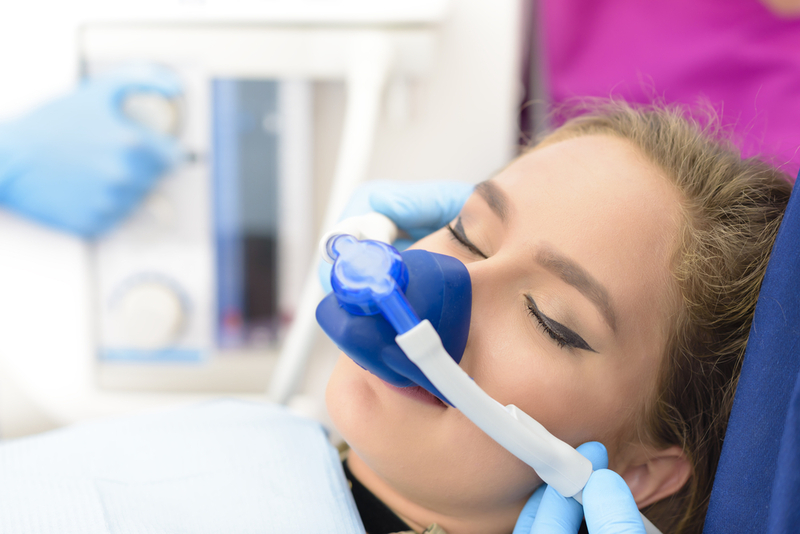 Dr. Chun has the training, license and experience to provide various types of anesthesia for each individual patient and to help advise them on the selection of the appropriate anesthesia for their specific procedure. Everyone has different anxiety levels, pain thresholds and expectations of surgery along with specific surgical needs that need to be individually assessed and discussed. Dr. Chun and his staff take the time to get to know each patient’s needs individually, allowing them to experience the procedure in a way that makes them feel safe, comfortable, and at ease. Injuries to the surrounding nerves – Sometimes, during the wisdom teeth removal process, injuries to surrounding nerves (such as the lingual nerve) may take place. This is usually considered medical malpractice, and can potentially result in partial or complete loss of sensation/pain in the back of mouth or tongue. When it does occur, surgical treatment is necessary and the chances of your sensations being restored are fairly good. Sinus communications (openings) – Because the upper wisdom teeth are situated so close to the sinuses, their removal can create an opening/passageway between your mouth and your sinuses. When this happens, the opening will usually close spontaneously, but you may receive special instructions to follow to ensure the healing process continues uninterrupted. Post-operative dry sockets and infections – Dry sockets are the most common problem people experience following dental surgery. Dry sockets occur when there is a premature loss of a blood clot in the empty tooth socket, and are usually experienced as a pain that starts in the ear and then radiates downward towards the chin. Upon discharge, your postoperative kit will include post-procedure guidelines, a prescription for pain medication, antibiotics only if indicated as most routine third molar removals do not need it, and a follow-up appointment in one week for a wound healing check. A hygiene check and instructions for future care / possible future removal may be needed as well. If you have any questions, please do not hesitate to call us at (925) 833-8516 or check out our wisdom teeth aftercare page. Will I be asleep when I get my wisdom teeth taken out? Although “going to sleep” is the norm, choosing to be awake during the removal of your wisdom teeth is always an option. For smaller cases, patients can opt to only receive local anesthesia and remain awake the entire time. However, most of the time Dr. Chun recommends that patients remain asleep to ease anxiety and increase comfort. In total, you will usually be asleep for around 30 minutes. This ensures that you will not experience any pain or discomfort throughout the entire procedure. You can usually expect the entire process to take roughly an hour and a half to two hours. That is the time from checking in at our office to checking out after the procedure is complete. Keep in mind, that all cases are unique, and some can take more or less time than that. When can I go back to school after having my wisdom teeth extracted? Usually, you will be able to go back to school the day following the procedure. When can I get back to strenuous activities/workouts/sports? It is recommended that you wait 4-5 days before participating in any strenuous activities. This waiting period will allow you the amount of time necessary for a complete healing process. How long should I be on pain medicine? Most patients are off narcotic pain medicine within one to two days. They can switch to ibuprofen or Tylenol if they choose. It is recommended that the patient not be on narcotic medication for any longer than 3 days. How much is wisdom teeth extraction going to cost? Sometimes roots are wrapped around a nerve, teeth are living at an unusual depth in the mouth, or there is some time of bone grafting necessary. We can’t give accurate estimates unless we know the extent of the patient’s situation, but there are usually some financing or insurance options available. Here is an additional resource when it comes to wisdom tooth extraction pricing. Wisdom teeth removal is a very common procedure. The extraction of the teeth provides pain relief that patients experience when they have improperly erupted wisdom teeth. If you are experiencing any unpleasant sensations or infections, and think that your wisdom teeth may be to blame, feel free to contact us here or call us at (925) 833-8516 to schedule your first visit.